We have all had to wait for test results after a doctor’s visit. In cases where a serious disease is suspected, a prolonged waiting period can be one filled with agonizing worry and anxiety. In certain scenarios, receiving medical test results earlier may even positively impact the treatment course – allowing patients to start therapy sooner. Group K Diagnostics (GKD), is an innovative company bringing routine lab tests to the patient’s bedside and developing technologies that have shrunk the waiting time from days to minutes. Some of the many tests they are tackling include liver function, liver cancer, hepatitis and HIV, along with comprehensive metabolic panels and complete blood counts. We recently had a chance to chat with the company’s founder and CEO, Brianna Wronko, about their work and recent clinical trial. Mohammad Saleh, Medgadget: Tell us about your background and how you came to be the CEO for Group K Diagnostics. 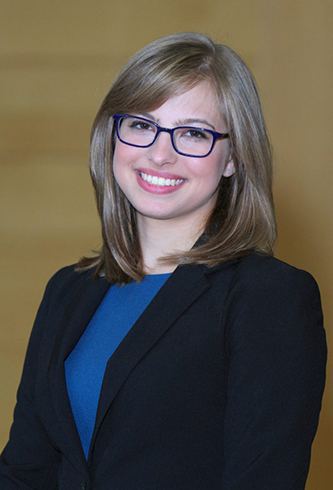 Brianna Wronko, Group K Diagnostics: My formal training is a Bachelors of Bioengineering from the University of Pennsylvania. My practical training is as a nanofabrication and device engineer. My academic work was in microfluidics with a focus on immunology. Through that, I became one of the leading experts in manufacturing microfluidics ranging from lab-on-a-chip, traditional PDMS casts, and paper. I wanted to go to medical school, so I spent a year and a half working at a local HIV clinic and about 6 months rotating through other hospital specialties. One of the biggest problems I saw in the HIV clinic was many of our patients having to go somewhere else to get their diagnostic tests done. I decided to apply my expertise in microfluidics to tackle the problem I had consistently seen in the clinic to form the foundations for GKD. I had a mentor who said it was ethically irresponsible to create a technology and not find a way for it to move forward. Medgadget: What’s the story behind the company’s name? Wronko: K was my group letter for the research project that I initiated to start the technology behind the company. When I had to file paperwork for grants, we needed to legalize our name. That’s how Group K Diagnostics came by. Medgadget: Are you currently working with that research group? Wronko: We’ve had people come and go, but the team now consists of the core people who helped over the last year or so. We have nine full-time employees in the U.S. and a global development team of ten. Medgadget: Give our readers an overview of your mission and how you’re working towards it. Wronko: Our mission is to improve technology that’s available to patients and providers to make the diagnostics process simple, fit it into the clinical workflow, and provide the urgent, actionable information that clinicians or patients need to deliver the best treatment. We do that by developing our MultiNostic device, which generates bloodwork results in 20 minutes or less. We have completed clinical trials for our first diagnostic, a liver function test, which will be submitted to the FDA pending the reopening of the government. We also have cancer screening, kidney function, electrolytes, infectious diseases, and more diagnostic tests coming up in our development pipeline. Medgadget: How are these diagnostic tests typically performed and how are you doing them differently? Wronko: These are typically performed by having your blood drawn by a technician or nurse at a local lab, and you would expect to receive your results within a few days, depending on the test. That’s days, not minutes. We’re able to do these tests using a fingerstick right at the doctor’s office, so the patient doesn’t have to go anywhere else. Medgadget: Tell us more about the science driving your company. Wronko: Paper microfluidics is a great technique because it allows for mass production and it’s cost-effective. This technology forms the foundation for our diagnostic tests, and we are able to use different chemical or immune reactions (depending on the type of test) to result in a color change. But color changes are typically difficult to read or quantify. We have an accompanying software application on smartphones that reads that color and accurately translates it to a quantitative number as in a traditional lab report. Beyond that, we also have supplemental software that covers things like epidemiological tracking, uploading to electronic health records, patient trends over time, patient education and access to their own results. Medgadget: You’ve already started clinical trials for the liver function test. What have you observed so far and how has the solution impacted the experience of those involved? Wronko: Our preclinical data was showing about 98% accuracy and 99% reproducibility, and this was confirmed by our clinical trial findings. Each liver function test produced an accuracy of 98% or higher. 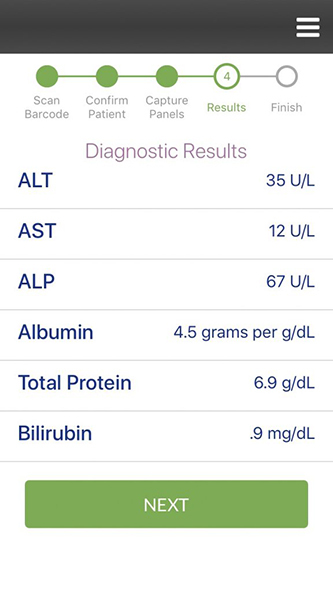 Our clinical trials are now complete, and we are happy to announce an accuracy level of greater than 98% for all of our liver function tests. On a patient level, we built the device for patients and physicians in mind, so we have seen a lot of the anxiety of waiting for tests replaced by excitement surrounding the ability to see your results right away. Similarly, physicians like not having to spend two or three hours at the end of their day giving call-backs to patients. Medgadget: Will there be an at-home test kit or do you plan to roll it out purely in a clinical setting? Wronko: This will not be an at-home test. It will be like any other vital sign monitor at a clinic. We’re aiming for a CLIA waiver, which would enable medical assistants to perform the test in the same manner they take your height or weight. Medgadget: Many of our readers are aware of the Theranos story. How do you address concerns that this is another attempt at something that will not work? Is your vision different? Wronko: Theranos did not really have any supporting technology. If you dig into the story, it was all just smoke and mirrors. We have an actual device that has completed clinical trials and we have supporting preclinical data. We’re going above and beyond what the FDA requires for approval. We’re not positioning ourselves as the silver bullet. Theranos advertised the possibility of enabling patients to freely order any blood test available. There are so many different tests and there is no test that covers them all. Our technology at GKD will do the majority of commonly ordered tests, such as comprehensive metabolic panels, complete blood counts, kidney or liver function, hepatitis screening, and more. We cannot do specialized tests like a sedimentation rate, because you have to visually analyze the blood to perform the test. Sure, we also want to expand healthcare access, but our vision is to ethically help patients using our technology. Medgadget: You mentioned a variety of tests. What do you have preclinical data for and which ones are on your to-do list? Wronko: We have preclinical data for comprehensive metabolic panel and liver function. We have clinical data for liver function. The rest are under active research and development or in preclinical trials. We have about 60 different tests in our pipeline. A standard reimbursement code for blood tests covers 250 tests, so we’ve got our work cut out for us. Medgadget: Where do you see Group K Diagnostics in 5 to 10 years? Wronko: I see our tests being used in the majority of clinical settings, where we’re able to help provide better, faster care for a larger number of people – which is what both patients and physicians are asking for! In the future, there is a possibility of at-home tests, but our main focus is definitely in the clinic. For more information, check out the Group K Diagnostics website..